This card is ideal for a nanny birthday card or a mother's day for grandma card. Parent and child team up to make this grandmother card together. Grandmothers will delight to get a card made by both their own child and grandchild. It is also fun for the parents to get involved in the paint fun for once instead of just cleaning up after it! Scissors if you need to cut the card. Paint suitable for fingerpainting in green, purple, and white. I like to use washable paint for little kids. Baby wipes for easy paint cleanup on the spot. A palette. I used aluminum foil - simply scrunch up and throw away when finished. Something to spread the paint out on the palette. I used paintbrushes as they were handy, but scrap pieces of card would work well too. Old newspaper to keep you work surface clean. Hairdryer if you want to speed up drying time. Make a card out of the cardboard. Keep in mind the size of the envelope (if using) and how much room you will need for your particular hands. The card shown here is an A4 sheet of cardboard folded in half. Spread out the green paint on your palette. 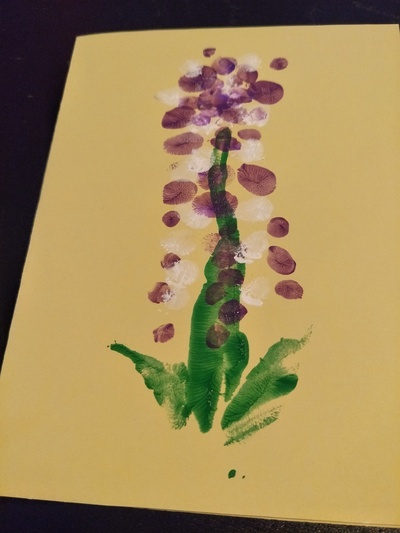 Parent: dip the side of your hand (little finger side) into the green paint and then print the stem of the hyacinth on the card. 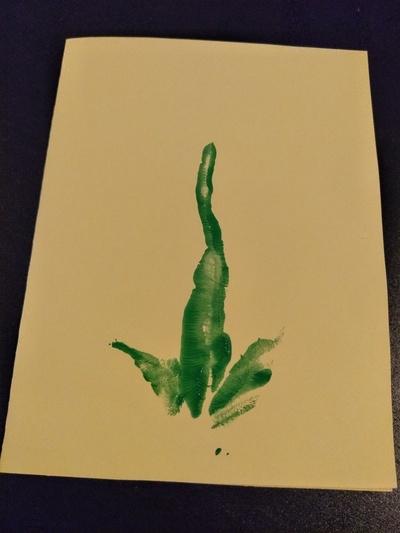 Child: do the same but print the 2 leaves of the hyacinth. Your card should now look like the picture below. When the green paint is dry, put the purple and white paint on your palette and spread it out ready to use. Parent & Child: Put purple and white fingerprints all around the hyacinth stem. When the card is dry, write your personal message for grandma inside the card.